We've been toying around with the idea of moving my studio space. Currently my studio is right next to the room where we sleep. The workbench where I do all of my fabrication, production and packaging is right up against the wall. On the other side of that wall is our bed. This means that whenever Sylas is sleeping I am unable to work because of the noise level of my production work. It never seems to fail that just when I am ready to get to my production work each day John is putting Sylas down for his nap. Sylas generally sleeps for about 2 hours and I am unable to work during that time. I usually use that time to do miscellaneous computer work I need to get done but I really need that time for production. My jewelry business produces enough work for it to be full time hours and waiting those two nap time hours means working well past dinner time. Also, during the rush seasons like Valentine's Day, Mother's Day, the December holidays I need to work during the night to get orders shipped out in a timely manner. We have a finished room in our basement and we thought we might fix it up as new studio space. Over the weekend we found out that it won't work out for a couple of reasons. We are now looking at ways to rearrange our sleeping area and my studio space. As the rearranging takes place I am going to be doing some redecorating and I'm excited. I currently have a pretty great set up. I have a huge chalkboard framed by a re-purposed, rustic teal wooden screen door, my work bench is a 7 foot long farmhouse table and my packaging station is a little urban farmhouse style table with drawers. I also have a yellow refinished hutch and a spot for my sewing machine. Everything fits just so and I love the pieces I have to work with. However, I'd like to have some ambiance in there - maybe new paint, some twinkly lights, some kind of change that is fun. The photo above shows a studio space from my "studio space inspiration" Pinterest board where I've bookmarked ideas for my new space. I love the bright white backdrop and L-shaped work set up. I currently have an L shaped set up as well and it is key for separating work, computer and packaging space. 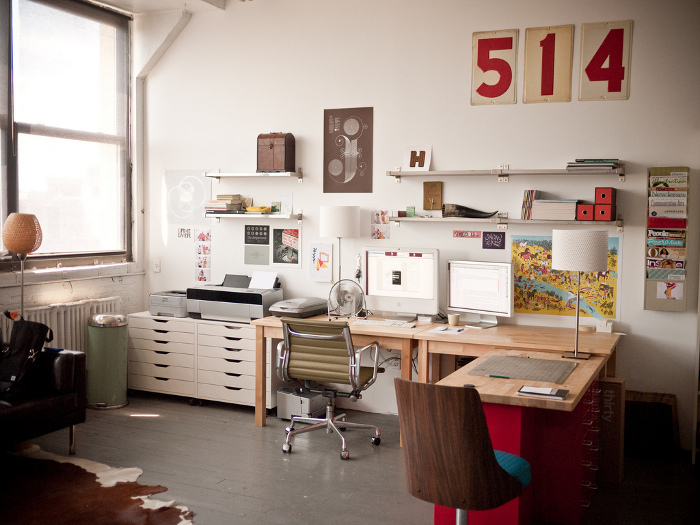 I love the vintage 504 signs - I am sure they represent something special to the studio space owner. There is lots of great light and nice pops of color around the space. In the next few weeks John and I will be making some decisions about how we'll rearrange things and if the changes are drastic I'll be posting some before and after photos. Image Jessica Hische via flickr and found via Pinterest. wanted to let you know, i have awarded you the liebster award!